Author Carmen Wong Ulrich has spelled out where we (I mean the 18 to 34-year old "generation") are falling short financially and the debt around us that seems impossibble to conquer. The American economy is supposed to be on the up and up, with more jobs available (I haven't found one in three years!) and interest rates are reasonably steady (compared to where I come from), so why the panic? She points out that it's not predominantly credit card debt as people think, it's mostly the high cost of a college education, and in truth, of just being a young person and having to set up a life after college. The pressure to get a degree is more fierce than ever, with statistics showing significant differences in earnings between those with degrees and those without. College debt vs earnings run around (in 2003) $17,900 and $26,000 - an immense amount of money to be facing just when your studying stops and your earning starts. Graduate students can more than double their debt figure. The sad thing about American culture (more so nowadays), is the "I've got to have everything" syndrome and being judged on your looks and what (or who) you're wearing. I believe in the "need" vs "want" scenario, and Ms. Ulrich also covers this early in the book. Establishing these two aspects will give you a greater perspective on how to organize your finances no matter how meager. I'm living proof that you "need" very, very little. Financial goals are important and are also covered here. After each chapter there are relevant web address where you can find more information. 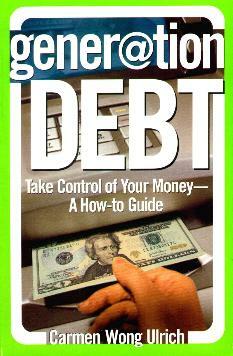 Other topics covered in the book include student loans, credit card debt, rent or buy, tax insurance, and more. Conclusion - Everyone should have this book! Or at least read it.